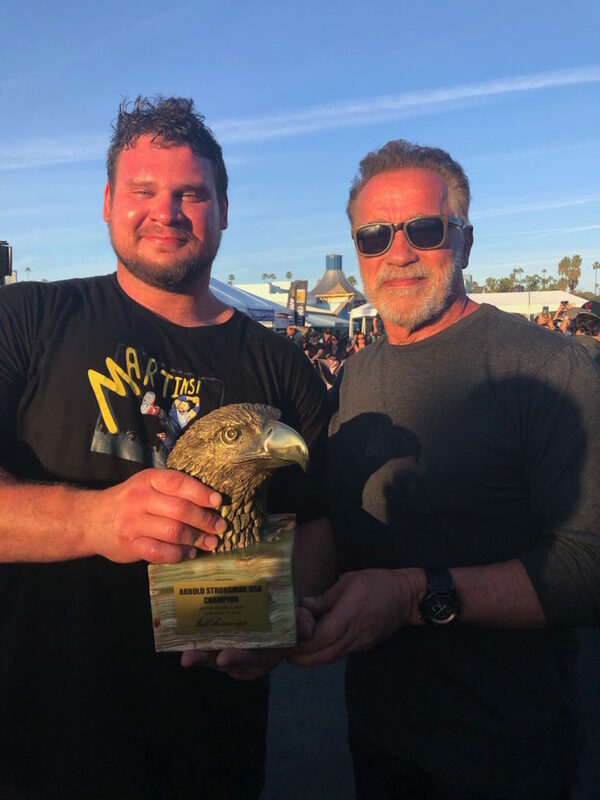 The thousands of people who made their way to the Santa Monica Pier to watch the inaugural Arnold Strongman USA competition were in for quite the show. With Arnold Schwarzenegger, Lou Ferrigno, and many other notable fitness personalities in attendance, nine athletes gave their best efforts in hopes to qualify for the Arnold Strongman Classic in Columbus, Ohio. At the end of the day, Martins Licis bested Mateusz Kieliszkowski in what Dr. Bill Crawford called a showdown of “the future of strongman” to take the win. Here’s a brief recap of what went down in Santa Monica. The day began with the athletes pulling a 1952 Mack Fire Truck that had a total weight of 17,000 pounds for 30 feet in the fastest time possible. Kieliszkowski won in dominating fashion with a time of 17.91 seconds. No other athlete finished below 19 seconds. Next up was the 385 pound log for reps. Only four men lifted the log for at least 1 complete rep. Matjaz Belsak and Rauno Heinla were able to perform 2 reps each. Kieliszkowski went last and easily did 3 reps before walking away from the log and took his second straight event win. At this point, many of the people there thought the competition was basically over and everyone else was battling for second. Starting with a weight of 725 pounds, the goal was to be the last man to complete a rep with the heaviest weight possible. Kieliszkowski would be eliminated before the weight passed the 900 pound mark. By the time the weight reached 950 pounds, Jerry Pritchett was the only one who was able to complete the lift and did so rather easily. The Arizona native is known for his deadlifting prowess. Carrying a 400 pound object that’s solid would be a challenge. A sandbag can change shape while you’re moving it so this was a difficult task. Nonetheless, every athlete were able to make it at least 60 feet on the course. Kieliszkowski would make it to 150. Heinla and Licis would both beat that mark by 1 foot and tie at 151 feet to share the winning points. The 375 pound stone would be too much at this point in the day for Brian Clark as well as Jitse Kramer. Pritchett would bow out of the competition at this point. Belsak would get 1 rep while Heinla completed 2 with a 3rd rep not being called as completed. Kieliszkowski completed 5 reps and appeared to have done what he needed to do to secure the victory. However, Licis would go last and tie the mark which gave him the victory for the day. Among the first to greet him was Schwarzenegger himself. JF Caron and Mateusz Ostaszewski both started the competition and would withdraw early on. Licis was already qualified for the Arnold Strongman Classic thanks to winning another event earlier in the year. Thanks to securing points in the Arnold Pro Strongman World Series standings, Pritchett, Kieliszkowski, and Belsak also have now qualified for the ASC in Columbus as well. All the proceeds raised in ticket sales and auctions went to benefit California Firefighters.